According to the United States Census Bureau, as of December 30, 2016, the estimated population of the U.S. was more than 300 million, with the world population estimated at over seven billion. These more than seven billion human beings on our planet share their unique voices to creatively express emotion, inspire change, engage in conversation, and foster understanding. Today, in our fluctuating political climate, interpersonal communication is essential to bridging gaps and engendering empathy. Regardless of our views or how we feel about important issues, our stories will never be understood unless we can effectively communicate our ideas and opinions. When we collaborate, we give others the opportunity to look at the world from a different perspective. Each of us has an inimitable story to tell; our perception of the world is shaped by those we interact with, from the situations we were born into, and from the actions that we take throughout our lives. The more we share and listen to these disparate perspectives, the better we are able to reason, question, and contemplate issues that can ultimately shape our world now and in the future. The voice is paramount in sharing human stories, thoughts, and ideas, as it is a uniquely impactful medium by which to transmit knowledge and information and, most importantly, to develop relationships with one another. On this April 16, World Voice Day 2017, I encourage you to take an introspective look at the importance of vocal health and hygiene to daily life and communication, perspective, and empathy. As otolaryngologists, we have the unique opportunity to help people everywhere—from around the globe down to our local communities—- to better understand the importance of caring for the voice, partaking in healthy vocal behaviors, and being able to recognize when these vocal disturbances need to be further evaluated. Sharing otolaryngologic knowledge about vocalization and disorders associated with the larynx can ultimately have a substantial impact on public health. One way in which we, as otolaryngologists, can promote vocal health in our own communities is to reach out to various medical societies to share information regarding voice disorder identification. Enlightening physicians in other fields about how to listen, not only to what patients are saying, but also to listen to how they are saying it, can be very beneficial. 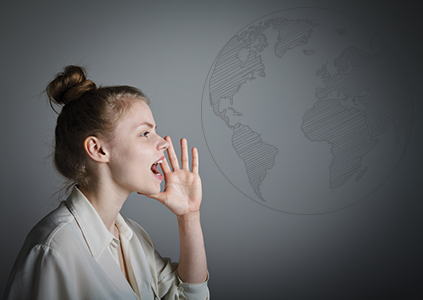 This sharing of information could potentially provide a safeguard for patients with voice disorders, keeping them from “slipping through the cracks,” even if they do not think that they have a problem with their voice. Providing examples of how to recognize voice changes such as vocal roughness, pitch breaks, or tremor can assist providers in determining when an appropriate referral is warranted. Another avenue for sharing information and increasing awareness about voice disorders is to engage in community outreach, particularly with groups whose voices are integral to their livelihood. This could include local performing arts elementary and high schools, community choral and theater groups, educators, or call centers. When meeting with these groups, vocal anatomy and also the physiology of voice production are potential topics of discussion. Download this 2017 World Voice Day Poster to hang in your waiting room. As a laryngologist who frequently lectures to these specific groups, I often find it surprising how many people, who rely on their voice as their means of employment, do not know the mechanics behind it or what their larynx looks like. It is personally gratifying to show them how their “instrument” actually works. Important information that these groups might also benefit from includes material on common voice disorders, essential vocal health guidelines, and the basics of healthy speaking and singing technique. Partnering with our speech and language pathology colleagues for these outreach lectures can also be extremely valuable to the audience. 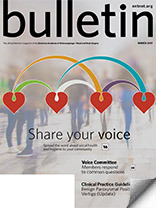 Overall, our goal as otolaryngologists, on World Voice Day and every day, is to encourage our patients to stay vocally healthy so that they may have a voice with which to express themselves and connect with others, thereby fostering understanding and empathy–vital components to our existence as human beings. Share this poster with your patients and spread the word about the importance of a healthy voice. 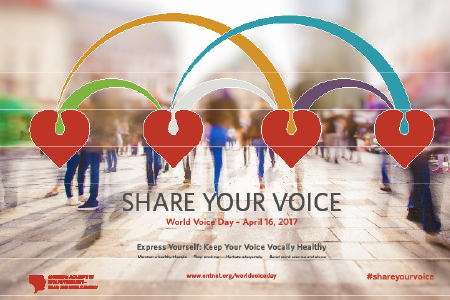 Visit www.entnet.org/worldvoiceday to print your 2017 poster and access other World Voice Day resources. Go to www.entnet.org/worldvoiceday to access the high-resolution print file. Upload the file to your local office supply store’s website or save the file and take it to the store for printing. or try your drug store. Maintain a healthy lifestyle that includes a balanced diet, 30-60 minutes of exercise daily, and restorative sleep. Make sure to adequately hydrate by consuming at least six to eight glasses of water daily to optimize laryngeal mucus production. During drier months, a personal humidifier may also help combat laryngeal dryness. Avoidance of caffeinated beverages and alcohol can also help prevent dryness and dehydration. Stop smoking! Smoking can cause significant irritation and swelling of the vocal folds that may permanently change voice quality. Smoking can also lead to laryngeal cancer. Avoid overuse and abuse of the voice by warming up before a period of heavy voice use, avoidance of yelling or screaming, and considering amplification if routinely speaking in loud environments or over background noise. Watch for signs of vocal pathology. Changes in the pitch, character, quality, tone, or vocal effort related to the voice may indicate a significant problem such as cancer, infection, or lesions. Share concerns with your physician, who may recommend a videostroboscopy to further evaluate your symptoms.